Large Scale Agile and Scrum vs. Waterfall: Agile is 6X More Successful, 1/4 the Cost, and 10X Faster Payback! A pair of recent findings from the Standish Group confirm the astonishing success and cost savings of Agile approaches over waterfall. In the “Chaos Report 2015“, Standish found that large Agile projects are 6X more successful than waterfall projects. While Standish doesn’t get specific on what is a “large” project, it’s worth noting that “Large” is the biggest size category for projects and their data encompasses over 10,000 software projects. * Note that the activities depicted on the graph were done sequentially via waterfall, but iteratively via Agile. It should also be noted that a survey from Forrester Research showed that of all companies attempting Agile, some 90% are using Scrum. Just to re-iterate — 6X more successful, cost payback 10X faster, and 4X cheaper. How is that for Better, Faster, Cheaper? At AgileSoftwareTraining.com, we provide coaching, consulting, and training solutions to help your company achieve the astounding success of Agile and Scrum approaches. Contact us today for a free consultation. So, if you’re an organization that is doing waterfall or struggling with Agile, what are you waiting for? The research is overwhelmingly in favor of Agile and Scrum approaches. Get on the road to millions more in profit and cost savings. No seriously, what are you waiting for? In my previous post, I discussed the New New Product Owner as The Product Marketplace expert. In this post, we explore the “Product Visionary” focus area. The Product Owner is the chief product visionary. The PO should be able to clearly articulate the product vision to the Scrum Team and key stakeholders, and how that vision aims to maximize the value of the product and of the work the Scrum Team performs. The PO should communicate and re-iterate this vision early and often, reminding all involved of how to help maximize value. Utilizing the underlying empirical product planning features of Scrum, the PO should also be ready to make strategic pivots for the product vision whenever there are significant changes in how value can or likely be captured. This vision is brought to life in a more tactical way, via the Product Backlog and iterating towards that vision every Sprint. 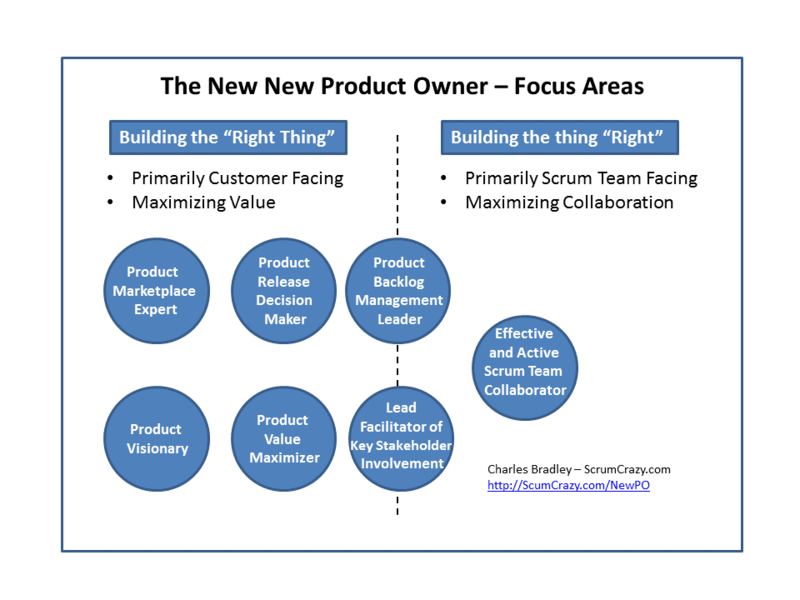 In my next post, we’ll discuss the New New Product Owner as the Release Decision Maker.